What better way to go full fledge spring than millennial pink + melodramatic purple? 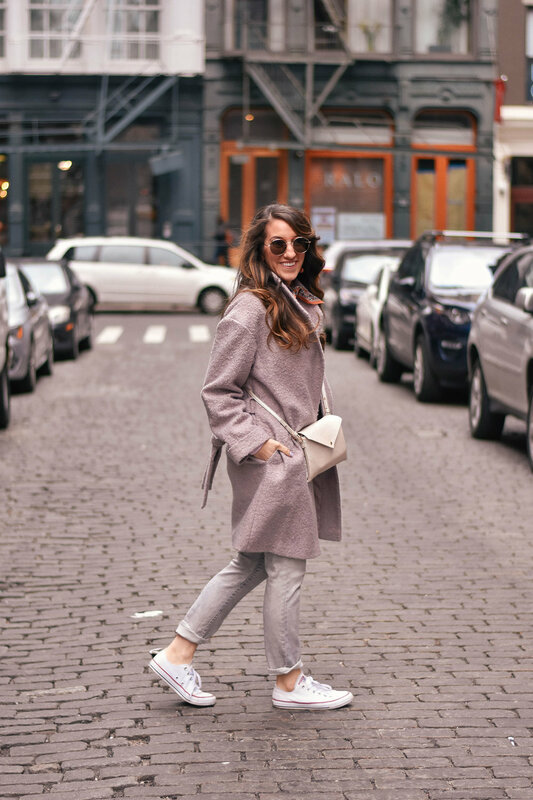 I bought this coat last year for this NYC trip, and I talked in this post about why it was the perfect choice for spring. Here in the Midwest we don’t experience the season much to speak to, and it basically equates to an extension of winter, which makes it hard to dive into the pretty warm weather apparel. Thankfully, we’ve experienced some decent days this week here in Columbus! 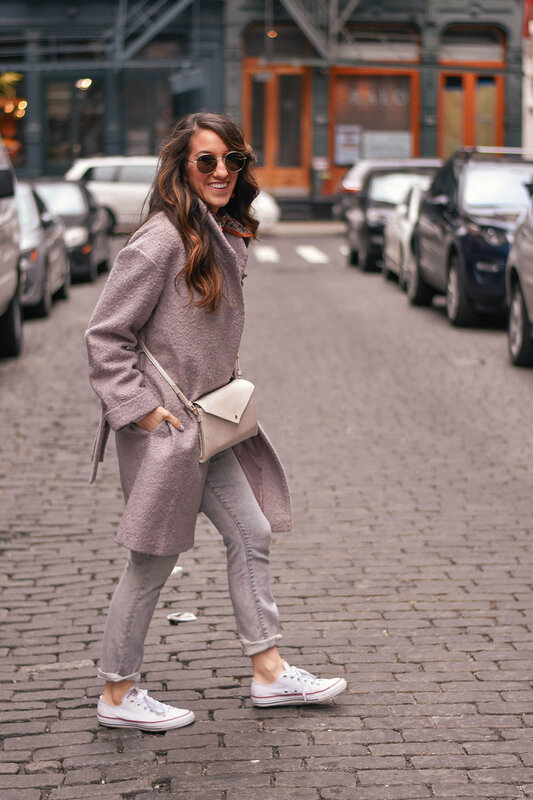 Playing with pastels and lighter shades is the perfect way to forego frostbite, but soften into those spring vibes, especially when it comes to a coat. Also, hi. The last couple months have been a bit of a whirlwind, but here I am. Thank you for following along on my little corner of the internet! I’m honestly totally fine with winter through January, and even February. I like snow, I like living in a place that has 3 and a half seasons, although I wish it was a full four. That spring thing is a little opportunistic, Midwest, if we could work on that. But, honestly, I like winter, when there is snow. Fresh blankets of snow regularly, preferably. Come March though, I’m marching on. To warmer weather hopefully. Actually last night Cassidy and I were talking about a trip to Chicago… so that should be balmy. 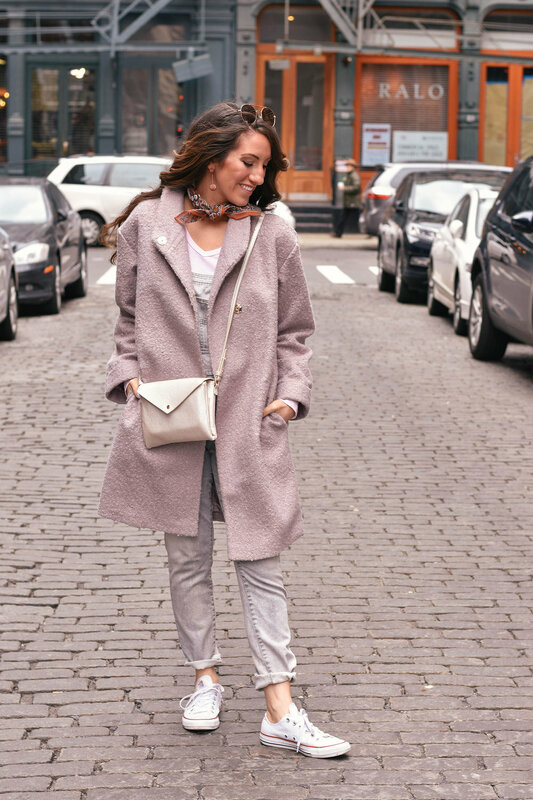 Anthropologie launched this coat in the fall and it sold out so quickly. Thankfully, it came back in stock, but then went to backorder just as quickly. I purchased it anyway because I was ob-sessed. All that to say, it finally arrived, and it’s all I wanna wear, and now the temperature has dropped 30 degrees (to below freezing) and I have to bundle up like it’s the North Pole. [insert eye roll] Also, with the camo pants… I’m a little extra, but I’m ok with it. I am extra, let’s be honest. Did this snow day completely ruin anyone else’s weekend plans?! We were supposed to go to Indy for the day on Saturday, and I was really looking forward to seeing some friends, but I’ll be honest, I feel like the snow day in was exactly what we needed. Cassidy and I were able to make some progress on unpacking and organizing the apartment, but still balance it out with enjoying some much anticipated relaxation as well. It was fun getting to see our neighborhood blanketed in snow and so many people still out and sloshing through for a bite to eat. We brought food back to our apartment, basked in the view, and watched movies. It was definitely exactly what we needed. It’s no secret I believe details make the outfit, as I’m sure a lot of folks do. Take away the fur on the jacket, the velvet laces on the jeans, the tassel on the bag, and maybe even the print from the shoes, and you’re left with a very simple look. Finding versatile pieces is important, but building up some basics with a little something extra can take an outfit to another level. Texture is a great way to add interest yet maintain a classic feel, especially if prints are intimidating. Leopard is basically a neutral, but an easy way to introduce a print to your wardrobe. If you’re stepping out of your comfort zone, the key is it doesn’t have to be all at once. Start by adding in one element. This look has a lot of little something extras, but incorporating one new extra with your neutrals, makes a look more unique, and gradually builds a versatile wardrobe to pair back with basic staples. I know I am late on getting some of these photos up from New York Fashion Week, but how appropriate are pretty PJs with the only morning of the year where you get photographed in such happening tomorrow? This is exactly why this post has two names. First, we’ll talk morning wear you want to be seen in and wear all day, followed by the low-down on this beautiful spot. If you haven’t heard Abercrombie & Fitch is back in the game with stylish apparel and killer deals, you’ve likely been living under a rock. 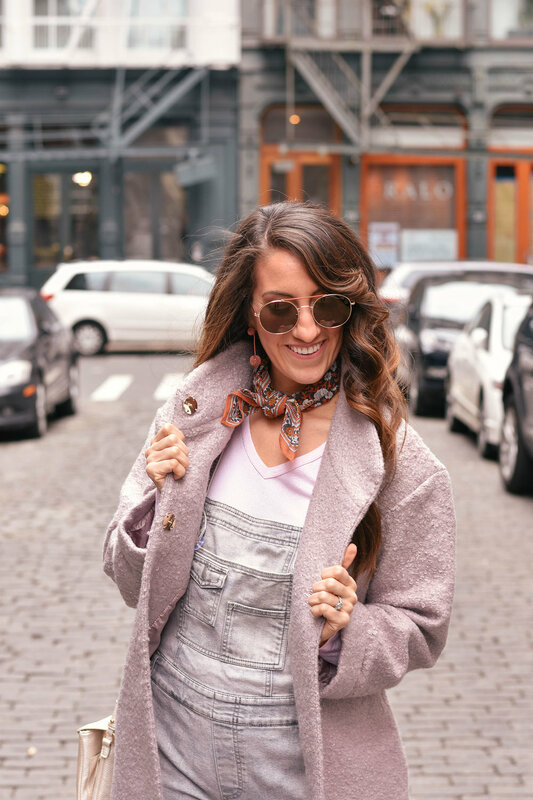 I purchased some of my first pieces in 10-15 years in preparation for fashion week, which you may have noticed if you’ve been following me on Instagram. Since then, the promotions continue to roll through, and I just can’t help myself. This sherpa cardigan is literally all I want to wear when I’m at home, but I keep having to fight Winnie for it. I’ve linked a few of my favorite cozies for snuggling up below! Cassidy and I were so excited to return to our favorite hotel, The Ludlow, on the LES for our trip to NYFW. We had stayed in the Queen Terrace before, which features a patio, and we thought this would be the perfect time of year to truly soak it up, but it spent the better part of the long weekend soaked. Ba dum ch. The problem with our sights on this unique experience (the terrace may be bigger than the room LOL). It was booked the first night we were going to be there! We were bummed, but decided what better time to splurge on the SkyBox, and then move rooms down to the terrace when it was available. The Ludlow was great about accommodating our resourceful request, and even moved our bags for us when it was ready. Not gonna lie, we were pretty proud of our ingenious idea! We thoroughly enjoyed the views our first day/night/morning on the East Side. It honestly doesn’t get any better than a dreary day taking in the concrete jungle. After sleeping in later than planned, Cassidy ventured out to get us breakfast at the infamous Tompkins Square Bagels while I started getting ready. I was thrilled to enjoy a gluten free bagel with chocolate chip cookie dough cream cheese. I mean, honestly. I love New York. We highly recommend The Ludlow, regardless of where you stay, but The Skybox and Terrace rooms are quite the treat. The Skybox also includes a tub with a view, as well as a small juliette balcony. The views just make my NYC loving heart beat a little faster. The service is amazing, the décor is unparalleled, the vintage bathrooms are luxurious, and as a guest at the hotel, you have exclusive access to the rooftop, which is like a quiet oasis vantage point of the hustle and bustle below. Cassidy and I love heading up there at night. This A&F sweater is so soft and comes in several great colorways. I love a classic gray, just like I love a classic ivory. Seriously, what is wrong with me sometimes? I guess when you find something that works, it’s hard to branch out, no matter who you are! And I am most certainly a creature of comfort.